Here is an update to the survey results reported earlier. I just received another 95 surveys which makes for a total of 289 responses. conducted back in November. The survey was included in the January Special Issue Newsletter that was delivered to Allandale households. Residents were asked to complete the short survey and mail it back by January 16th. and 1% have no opinion. Click here to see the results. What follows are the additional comments people submitted with the survey. 150 sq ft. I’m not hot on WalMart. large pay increase the city council rammed through without citizen input. travel. Business is business/everyone isn’t rich. Oler – on fixed incomes. give money to political committees! Don’t shop Walmart but we will if it’s only 3 minutes aways. Especially an xtra large 24-hour Walmart. I am especially concerned about traffic. support development at Northcross. Just not with Walmart. support redevelopment without a super walmart. 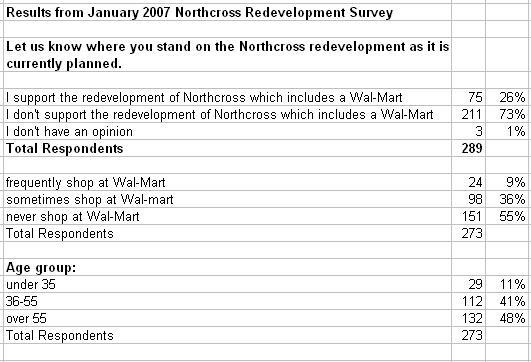 all for developing Northcross, but without a Big Box store. in this area. So I support it. vote out the City Council. Never shop there now. Too far, will if close. will I ever when I can walk there! needs development help but not Wal-Mart. WalMart brings in more traffic. large! Will create traffic headaches! Would love to see a smaller scale version. Wal-Mart will drive out smaller businesses. don’t need a Walgreens either. need Wal-Mart. Northcross has been redone with new tenants but none stay. of driving miles for shopping. No more condos wanted in our neighborhood. support a mix-use development including a grocery store. not multi-use: lofts, stores, etc. save gasoline, easy access, cheap medication and groceries. love to get a No Walmart sign. shop more often if a store was closer. A Walmart is a HUGE mistake. Clearly we need a redevelopement and a large grocery, but NOT Walmart. Allandale is a beautiful and unique part of Austin and getting better by the day. That developement could do WONDERS for all of us…if done properly. Walmart would send us in the opposite direction. Please THINK about it before you give in! Anything would be better than Walmart. I have tried four times to unsubscribe from the online yahoo account. Can someone please help me? I have tried four times to unsubscribe from yahoo groups for Allandale. Can someone please attend to this for me?